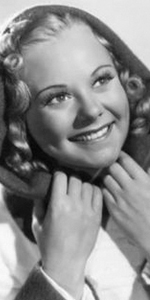 Sonja Henie represented a new type of celebrity; famed for being an Olympic figure-skating champion, she found her way to Hollywood, where her films became wildly popular. Her star became somewhat tarnished during World War II, but she continued to perform in ice shows while collecting an impressive collection of art. Sonja was the daughter of Wihelm Henie, who was a noted cyclist and speed skater; she and her brother Leif were raised in a wealthy household, encouraged to do well in sports. While Leif took up figure skating right away, Sonja excelled at skiing, tennis, swimming and horse riding. When Wilhelm discovered Sonja's talent for figure skating, he found her the best trainers, including Norwegian champion Oscar Holthe and Olympic champion Martin Stixrud. Wilhelm became a devoted promoter of his daughter's career. 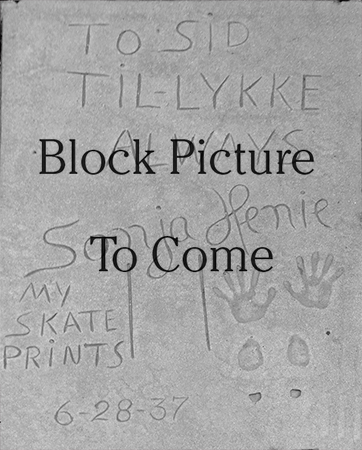 By 1921, Sonja was performing at major skating events, giving the 9-year-old exposure to the perssures of public performance. Sonja and her father attended the first Winter Olympics at Chamonix, France in 1924, and the next Winter Olympiad at St. Moritz, Switserland in 1928, where she won her first Gold Medal in figure skating. Additionally, Henie became the European champion from 1931 through 1936, and World Champion for every year from 1927 through 1936. She won the Gold Medal at the Winter Olympics at Lake Placid, New York in 1932, and at Garmisch-Partenkirchen, Germany in 1936, where she was greatly admired by the German Chancellor, Adolf Hitler. After you have done all that, what do you do for an encore? Sonja told her father that she always wanted to be a movie star, so Wilhelm moved the family to — Hollywood, where he rented an arena, staged a show starring Sonja, and invited all the top Hollywood people to attend. She signed a five-year contract with 20th Century-Fox. Her first film, One in a Million (which played the Chinese in January, 1937) featured footage of Henie taken at the 1936 Olympic Games, and was a tremendous success. Henie had a complex relationship with Hitler and the Nazi regime. After the 1936 Olympics, Henie lunched with Hitler at his Berghaus in Berchtesgaden. Reich Ministry of Public Enlightenment and Propaganda head Joseph Goebbels helped with the release of One in a Million in Gemany. For this, Henie family assets were left alone during the Nazi occupation of Norway. Henie became a naturalized citizen of the U.S. in 1941, and was involved in War Bond fundraising during World War II, but was reluctant to comment on Hitler or the Norwegian situation. Other Henie ice skating films, which were all fondly remembered by audiences of the day include: Thin Ice (which played the Chinese in September, 1937), Happy Landing (played the Chinese in Janaury, 1938), My Lucky Star (played in August, 1938), Second Fiddle (played in July, 1939), Everything Happens at Night (played in December, 1939), Sun Valley Serenade (played in August, 1941), Iceland (played in September, 1942), and Wintertime (played in September, 1943). While making these films, Henie teamed up with Arthur Wirtz to produce a touring ice show, the Hollywood Ice Revue which pioneered the format in America. The pair also prodiced the holiday ice shows at Radio City Music Hall into the 1940s. In 1950, Henie broke off with Wirtz, but her Sonja Henie Ice Revue couldn't compete with Wirtz's units and the newly-formed Ice Capades. She teamed with producer Morris Chalfen and toured Europe in Holiday on Ice, bringing great success, but a 1956 South American tour was a failure. Henie published her autobiography Mitt Livs Eventyr (My Life Adventure) in 1938 and revised it in 1953: it was published as Wings on My Feet in English in 1940 and 1954. She was planning a television special when she died from lukemia on a flight from Paris to Oslo in 1969. Henie was 57. Grauman's Chinese Theatre, Hollywood, California. Sonja Henie Forecourt ceremony, Monday, June 28, 1937. 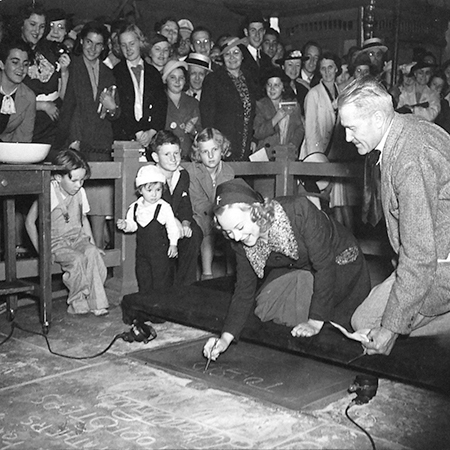 Unknown children look on as Sonja Henie begins her inspription, while cement artist Jean Klossner officiates.